I recently reallocated my retirement investments. This was my first major rebalancing in nearly a decade, and I thought it would be interesting to write up a guide to how I think about investing, which has been strongly influenced by the excellent posts on Bogleheads and indexfunds.com. Won’t need this money for decades. I’m fortunate enough to have a pretty stable job. Major expenses in the distant future (kids, college) will be funded by my future earnings, not current savings. For possible expenses and emergencies in the near future (house? unemployment? piano accident? ), I set aside cash in a liquid and low-risk savings account. The remainder of it, I invest as follows. High returns. The vast majority of professionally managed mutual funds underperform. I want to be confident that I have maximized my returns for whatever level of risk I decide to take on. Low risk of going broke. I am willing to accept large swings (e.g. stock market fluctuations). I am not willing to accept a chance of losing everything (e.g. no lottery tickets or angel investments). I reduce my risk through diversification. Those looking for more sophistication can read about Kelly Betting. Minimal time commitment. This is the big one. Tim Ferriss defines investing as “allocating resources to improve quality of life.” Every hour that I spend thinking about my investments is a lost hour that I could have spent doing something way more fun. I don’t want to have to think about when to buy and when to sell, when to short and when to long. I want to set my investment machine running and forget about it until I’m ready to retire. On a related note, at this point in my career, the value of my potential future earnings far exceeds what I’ve accumulated in savings. Even if money were my main concern, I’m better off thinking about how to earn more (ship some product, contract on the side, ask for a raise, advise a new company, found a startup) than figuring out how to squeeze an extra few tenths of a percent out of my investments. Efficient market theory roughly states that a stock’s market price reflects its true value. In other words, there are millions of other people out there who are also looking for an underpriced stock and you’re not going to find anything they missed. The case for efficient market theory has been severely damaged by bubbles and financial crises during the past few years, but it still turns out to be a decent rule of thumb. Another way to think about it is that while there are inefficiencies in the market, it takes time to find them. Since I’m not willing to spend that time, I may as well just assume that the market is efficient and leave it up to the billion-dollar hedge funds to go looking for tiny 0.001% arbitrage opportunities. So if the market is efficient, can you beat it? The answer is yes – sort of. Stocks are generally riskier than bonds, so you can adjust the riskiness of your portfolio by allocating more or less of it to stocks. A typical guideline for risk exposure is to “allocate your age in bonds”, i.e. if you’re 40 years old, 40% of your portfolio should be in bonds. Now, the value of an index like the Dow or the S&P 500 is largely determined by enormous companies like Microsoft, General Electric, and ExxonMobile. As companies go, these are pretty stable. Why is diversification so important? Imagine that I had two stocks, A and B. Let’s say they are equally risky, and so no matter which of them I invest in, I will average a 5% annual return. However, every time stock A goes up, stock B goes down (maybe A makes umbrellas and B makes sunglasses). So what happens if I put half my money in A and the other half in B? Well, I’ll still earn my 5% annual return, but since every time A goes down B goes up, and vice versa, I’ll see much smaller swings in the value of my portfolio. Smaller swings = less risk. So diversification is important, and the more stocks I can buy, the better. This sounds like it could be a pain, but fortunately, some smart people have already done that and packaged a whole bunch of stocks into a single bundle, which we now call a mutual fund. The specific mutual funds we’re interested in are called “index funds”. An index fund is just a mutual fund that is composed of the stocks in a particular index (like the Dow, or the S&P 500) and doesn’t attempt to do anything other than mirror that index’s performance. Because of this simple strategy, index funds typically have extremely low fees – often a tenth of what actively managed funds charge. Index funds also simplify more complicated investing tactics like tax loss harvesting. Since all the funds tracking the same index should have the same performance, we want to buy the funds with the lowest expense ratio. Vanguard is known for its low expense ratio index funds, but there are other options. You can buy index funds as either mutual funds or ETFs (“exchange traded funds”), they’re just different ways to purchase the same thing. I like ETFs because they’re slightly more tax efficient. At this point, execution is straightforward. 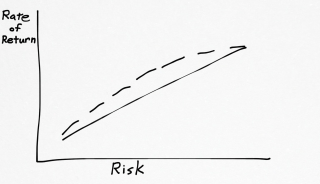 Decide how much risk you feel comfortable with, spread your portfolio across a mix of asset classes so that you end up at an appropriate point on the risk-reward curve, and then go out and buy index funds in each of those asset classes. If you’re really, really lazy, there are services like Wealthfront that will do this for you for a small fee. But you can set up a brokerage account and buy three ETFs yourself in less time than it took you to read this blog post. Example 1: Three-Fund Portfolio. For a simple, risk-adjusted portfolio, allocate your age in bonds (30 years old? 30% bonds), split the rest between domestic and international stocks, and call it a day. For example, 30% bonds (BND), 35% US stocks (VTI), 35% international stocks: (VXUS). If you’re tolerant of wild swings (i.e. how big a loss can you tolerate before you panic and pull your money out of the market at the worst possible time), you could increase your ratio of stocks to bonds, or even tilt your asset allocation toward some riskier but higher reward asset classes like small-cap value. My portfolio is heavily weighted toward small-cap value and emerging markets. Finally, when purchasing ETFs, do your best to place the least tax-efficient funds (i.e. your bond funds) into tax-sheltered accounts (IRAs, 401k, etc). In short, it only takes a few hours a year to beat the stock market. If you’re as forgetful as I am, you can probably reduce that time to a few hours a decade and not suffer major consequences. Fine print: This post assumes a fixed amount to invest. Leverage makes things more complicated, and organizations that can borrow money cheaply enough can get returns above the efficient frontier. Also, take the risk and return estimates with a grain of salt; past performance is not necessarily indicative of future results. Finally, I am not a financial advisor, I’m paid to make games. I just find this stuff interesting, so please don’t sue me. Here’s a disclaimer that says all of this could totally be made up so don’t listen to me and talk to a qualified professional before you do anything, which you agree would be at your own risk anyway. Finally, I’m sure there are errors in this post. If you find one, leave a comment or just tweet and me and I’ll fix it. Haven’t posted here in a while, but life has been busy! I ended up leaving Playdom a little while after the Disney acquisition to join Pocket Gems, where I’m still having fun in the fast-paced world of mobile gaming. Getting rid of the daily commute to the South Bay has been pretty great, too. I even found time to get married, which has also been a fun adventure. I’m working for Disney now! It’s official – Disney is acquiring Playdom! Actually, it’s been official for a few days now, I’m a little behind the times. I’m hoping that as we move out of “crazy startup” mode into “part of an actual company” mode, I might actually have some time to start posting here again. We’ll see. Wow, it’s been over three months since my last post. How embarrassing. I’ve been busy. In the beginning of April, I decided I wanted to start exploring applications for the iPhone. So I taught myself Objective C. And then the iPhone SDK. Four months later, I’m very excited and almost ready to launch. I usually use this blog as a bit of a personal journal, so I’m kinda bummed that I missed recording the past few months. But as launch nears, things should get a bit more interesting, so stay tuned. For now, it’s off to bed. I’ve got a tour of Seattle’s sewage treatment plant tomorrow mornning! Last Wednesday, nearly six years after graduating from Rice, I signed the paperwork for my very first full-time employee position. It’s been a good run, with a solid mix of grad school, self-employment, unemployment, and contracting positions, but with the economy going to hell in a handbasket, I feel like now is a good time to be gainfully employed. I’m now the Analytics and Search Manager at Tableau Software, where I’ve been working as a full-time contractor for a while now. My work focuses mainly on driving lead generation through the website – testing and optimizing the website experience, as well as increasing traffic through search engine optimization. I’m excited about a few of the projects I have on the horizon, though it’s frustrating that I can’t be as open about my work as I was when I was just working for myself.